Since the late 1970s the tennis community in St. Louis and Kansas City has helped turn MAC Sports and recreation surfaces into one of the Midwest’s leading tennis court builders. 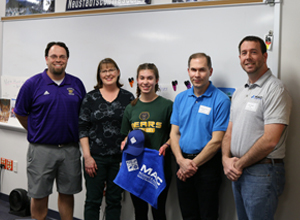 We created the MAC Tennis Scholarship to show our appreciation and support of the scholastic tennis community by helping to educate tomorrow’s leaders. We’re proud to continue championing those who share a love of tennis with a scholarship that helps fund their future education. 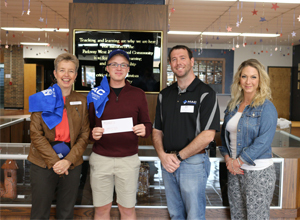 McConnell & Associates awards one male and one female graduating high school seniors from both the St. Louis and Kansas City Metros with a one-time $1,000.00 scholarship. Want to Apply for the MAC Tennis Scholarship? Our committee is excited to review your application. How has your involvement in the high school tennis community impacted your academic and personal growth? Disclaimer: Winner decisions are final and not subject to appeal. No application feedback is given. 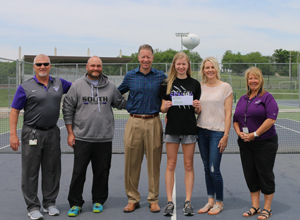 Tennis scholarship winners are notified by mid-April and will receive a phone call from McConnell & Associates to arrange a date to meet the team and receive the award. It is a great privilege to introduce last year’s winners of the 2018 inaugural MAC Tennis Scholarship. These four students, from the Kansas City and St. Louis area, demonstrated academic excellence, exemplary leadership, community involvement, and dedication to their sport. Anna is a Eureka High School graduate and was coached by Jason Conley. Cyril graduated from Parkway West High School and was coached by Katelyn McCreary. He currently attends Embry Riddle Aeronautical University where he is majoring in Aerospace Engineering. Abby is a Park Hill South High School graduate and was coached by Ian Cunliff. She continued her tennis career at Texas Weslyan University. 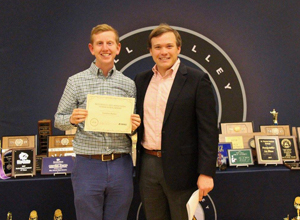 Landon graduated from Mill Valley High School and was coached by Steve Bock. He currently attends Kansas State University.